Among the documents the US Army seized in an outpost of the SS Reich Main Security Office (RSHA) was not only the Becker letter with its explicit discussion of gas vans, but also three telexes exchanged between the RSHA motor pool in Berlin and the Security Polices in Belgrade and Minsk. The telexes evidence the existence and operation of homicidal gas vans by the German paramilitary forces in Belgrade and Minsk, which is further extensively corroborated by other sources. The flimsy forgery allegation of the "Revisionist" gas van author Santiago Alvarez is rebutted in this posting. The Schäfer telex (Figure 1) was sent on 9 June 1942 from the head of the Security Service in Serbia, Emanuel Schäfer, to the head of the motor pool department of the Security Service in Berlin, Friedrich Pradel. It mentions the end of the killing operation at the Sajmište (Semlin) camp in Serbia, where the remaining Jews were killed with a homicidal gas van. It says that the "special vehicle Saurer" operated by the two "drivers sergeants Götz and Meyer" has finished its "special task" and can be sent back to Berlin. Because of a "cracked axle" in the back, the vehicle is "transferred by rail". Schäfer expected its arrival on "11 or 12 June 1942". On 10 June 1942, Pradel's superior Walther Rauff added a handwritten order to start its "immediate repair after arrival" and "to report the completion". The back side of the telex (Figure 2) comes along a series of handwritten memos from Pradel's staff. On 11 June 1942, Willy Just discussed the matter with Anton Sukkel and requested to be informed when the vehicle arrives. On 16 June 1942, the RSHA car mechanic Harry Wentritt reported the arrival of the vehicle and that "after thorough cleaning the repairs will be initiated immediately". Almost a month later, on 13 July 1942, Wentritt noted that "the s[pecial] vehicle [with license plate] Pol 71463 is finished and is to be sent to Riga with the driver". The reason why the second part was crossed out is not enlightened in the existent docmentation. It remains unclear if this gas van was really sent to Minsk via Riga. 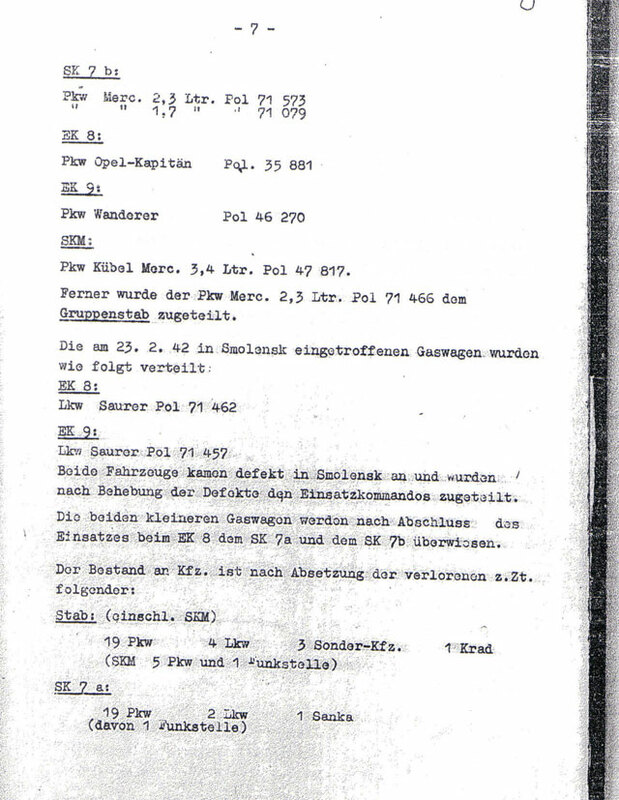 But the intended dispatch to Riga links the telex to another document from the same file, the Trühe telex (Figure 3). It was cabled on 15 June 1942 by the head of the administration of the commander of the Security Police and Security Service Ostland in Riga, Heinz Trühe, to the motor pool department of the Security Police of the RSHA in Berlin. It explains that in Minsk "a transport of Jews arrives weekly, which is to be subjected to a special treatment", that the "3 s[pecial] vehicles existing there do not suffice for this purpose" and that therefore "the allocation of another s[pecial] vehicle (5 tons)" is requested. Furthermore, Trühe requested to "send 20 exhaust hoses for the existing 3 s[pecial] vehicles (2 Daimond [sic], 1 Saurer)". The next day, Rauff added a handwritten request to find out when "the deployment of another s[pecial] vehicle can be expected", if "spare exhaust hoses [are] available" and to "submit draft for answer". On 22 June 1942, Rauff replied to Trühe (Rauff telex; Figure 4) that the "transfer of a 5 t Saurer can be expected middle of next month. The vehicle is currently at the RSHA for repairs and to make minor changes. 100 m hose will be sent along". On 13 July 1942, Wentritt added to the RSHA copy of Rauff's telex that the "remark of 13 July 1942 on the back side of the telex from Belgrade [the Schäfer telex]", which reported the completion of the Saurer special vehicle, has been called to the attention of the RSHA motor pool head Fritz Niederhausen and that "for technical reasons only 5 rings with 10 m hose can be sent along". 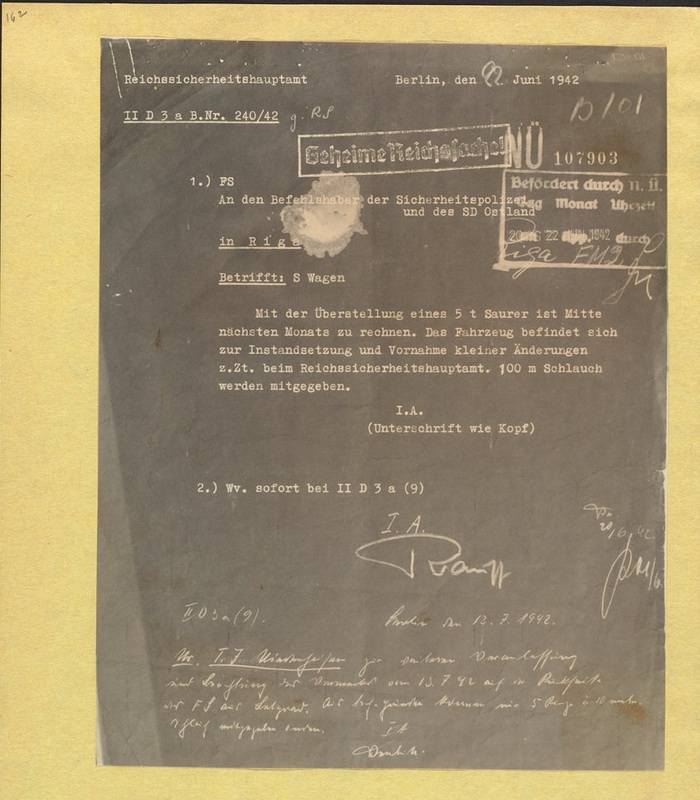 To sum these documents up, the Saurer "special vehicle" first carried out the "special task" in Belgrade, and after one month of repair and maintenance in Berlin it was supposed to be sent along with 50 m exhaust hoses to the Eastern territories to carry out the "special treatment" of Jews in Minsk. The term "Sonderbehandlung/special treatment" was the default euphemism for extra judicial killings within the German paramilitary forces. It is therefore clear that the telexes describe the use of homicidal gas vans in Serbia and Minsk. 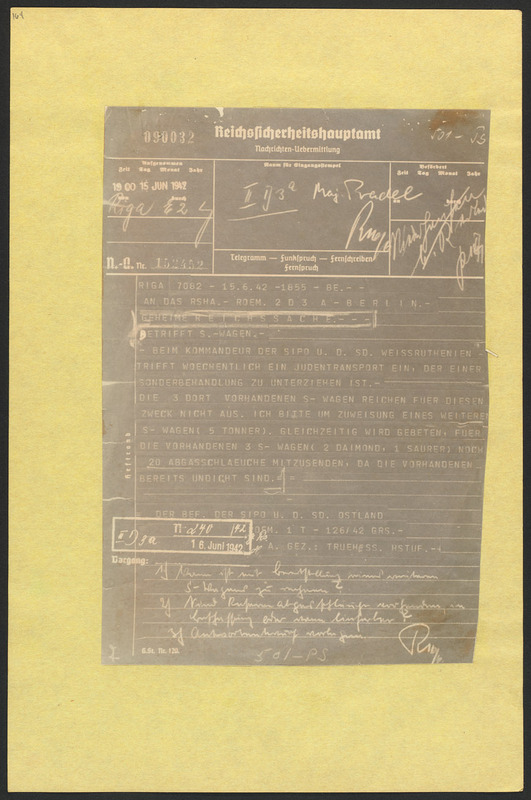 The text of incoming telexes has been pasted on a preprinted sheet of paper for signal transmission of the RSHA (see this corresponding sheet from the Gestapo Düsseldorf for comparison). They have an incoming stamp and were signed by Pradel's superiour Walther Rauff. The Schäfer telex was further signed by Pradel himself. The outgoing telex posseses a secret state affair stamp and the signatures of Rauff, Pradel and Wentritt. The telexes and the so called Becker letter were found by a unit of the 12th US Army in an RSHA depot in Bad Sulza. The docs reached the British Intelligence in London via Paris. They were shared with the Office of Strategic Services and then passed on to Nuremberg, where they were submitted as evidence PS-501 (see Note on Involvement of OSS in Locating Gas Van Documents PS-501). The mass extermination of Jews in the Sajmište camp in Serbia was already described in Rebuttal of Alvarez on Gas Vans: The Turner Letter. The killing by means of a homicidal gas van is corroborated e.g. by Turner's letter itself as well as by the testimonies of the people in charge of the operation - the Higher SS and Police Leader August Meyszner, the head of the Security Police in Serbia Emanuel Schäfer, the Sajmište camp commandant Herbert Andorfer and the Security Police member Edgar Enge (who is often mistakenly assigned as Andorfer's adjutant in the literature). The decimation of the Jewish camp at the time the vehicle operated in Belgrade is shown by German army records. "The telex of 9 June 1942 was drafted by the head of the office I (administration), whom the motor pool of my agency was subordinated to. Head of the office I was Hauptsturmführer Heller. This follows from the reference number. Heller no doubt knew about the activity of the gas van sent from Berlin.....The telex of 9 June 1942 shown to me again is an open telex, since any secrecy mark is missing. It was addressed to the office II D3 A in the RSHA. In this office the matters of the motor pool, among other things the operation of the gas vans, were dealt with....Head of the motor pool was according to my knowledge the Major of the Police Pradel, to whom my telex of 9 June 1942 is addressed." 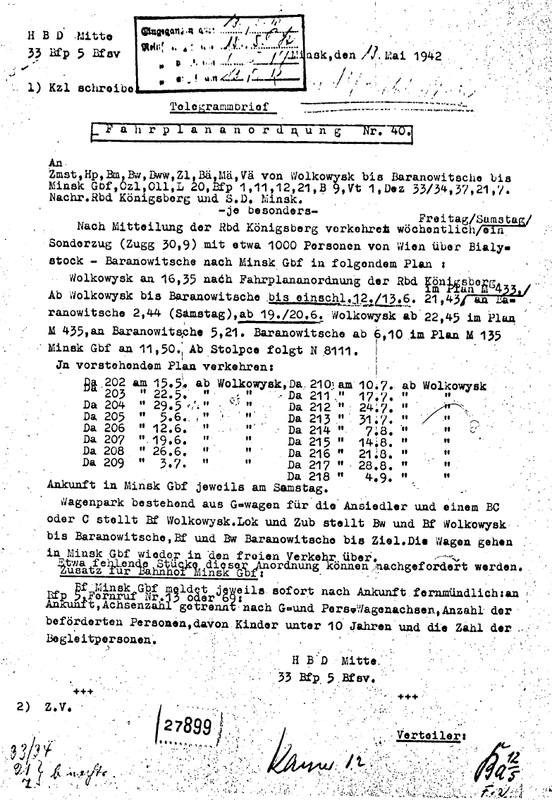 The weekly Jewish transports to Minsk mentioned in the Trühe telex were indeed planned according to German railway records. The railroad schedule order of the Main Railroad Directorate Center of 13 May 1942 lists "a weekly (Friday/Saturday) special train...with 1000 persons running from Vienna via Bialystok-Baranovice to Minsk goods stations" until 4 September 1942 (Figure 5, from Yad Vashem Archives (hereafter YVA), O.53/1, p. 74). In reality, Minsk received each nine transports from Vienna and Theresienstadt and each one from Cologne and Königsberg between 11 May - 7 October 1942 (see Gerlach, Kalkulierte Morde, 2012, p. 758f). According to the telex, the deportees were "specially treated" upon their arrival in Minsk. 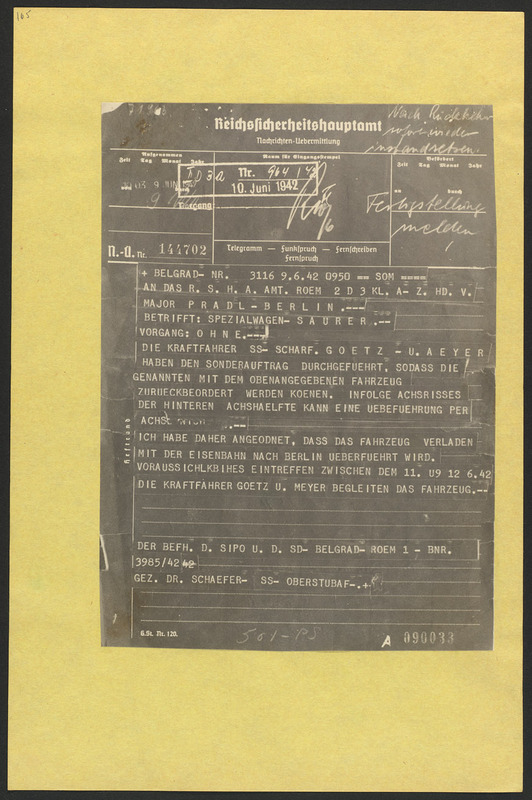 In the jargon of the German paramilitary forces, this term denoted the killing of people without judicial proceedings (see also Mattogno's special treatment of evidence and Rebuttal of Mattogno on Auschwitz, Part 5: Construction Documents, F: Cremation with Simultaneous Special Treatment). (activity reports of 17 May and 16 June 1942 of Gerhard Arlt, reproduced in Unsere Ehre heißt Treue, 1984, p. 246 and 250, my translation; Holocaust denier Thomas Kues, who is "skeptical of its authenticity", is debunked by Roberto in Thomas Kues on Maly Trostenets: Trying to discredit the Arlt Reports; one should add that the lack of an addressee in the reports is not an anomaly pointing to a forgery but was also a feature of the activity reports of the 1. and 5. SS-Totenkopfstandarte 4 of 20 February 1941 posted at forum.panzer-archiv.de). "I took over the two gas vans together with Göbel at the RSHA in Berlin and transferred them to Minsk....We were the first gas vans in Minsk...Another gas van driver was Harry Rübe from Berlin....Rübe brought a third gas van to Minsk....The first two vehicles were American Diamond trucks. They had to be painted and reconstructed in Germany. The third vehicle was a Saurer truck. I was employed with my gas van for 12 incoming Jewish transports. The transports arrived in the year 1942. Each transport consisted of about 1000 persons. I made 5-6 trips for each transport. In some cases, the Jews were partly picked up by trucks and shot at the execution site..."
"On the day of the action, all G-vans drove from Minsk to the South to a rail track. The Security Service run ahead and was already on the railway property. I saw a long freight train upon our arrival. Our G-vans were positioned about 150 - 200 m apart from the freight train with the doors towards the train. The freight wagons were still closed upon our arrival. Now the first wagon was opened by the accompanying commando. All Jews inside the wagon - men, women and children - had to get out and line up infront of the freight wagon. I could see from my position that a talk was given to the Jews...A Jew went ahead and led them from the train to the G-van, helped to enter the G-van and closed the doors. I just had to fit the lock...I am sure that these were Jews from the Reich, because I remember that I talked to a Jewish women from Vienna. The women noticed from my pronunciation that I was Viennese. She said that if she is received by fellow countrymen, then nothing can happen to her. When all G-vans were loaded - my G-van was loaded with about 70 victims - we drove about 5 km to the South. A large pit had been excavated here in an area of forest and fields. The pit was secured by nests of machine guns at some distance. SD men and Russian civilians were already at the pit. Now the usual gassing commenced. Afterwards the doors were opened, the Russians pulled the corpses from the vehicle, undressed them and layered them in the pit...According to the capacity of the G-vans , I estimate that about 700 - 1000 Jews were gassed on this day." The Trühe telex also requested "exhaust gas hoses as the available ones are already leaky". The use of flexible metal hoses to pipe the exhaust into the gassing box is corroborated by gas van drivers (e.g. examination of Wilhelm Findeisen of 30 December 1968, B 162/17919, p. 95; interrogation of Heinz Schlechte of 29 January 1963,YVA TR.10/1118, vol. 5, p. 535). The license plate POL 71463 of the "Saurer special vehicle" from Belgrade intended to support the mass extermination in Minsk according to the telexes was registered right after the license plate of the "Saurer...gas van" POL 71462 of Einsatzkommando 8 according to the operational and situation report of Einsatzgruppe B of 1 March 1942 (see Figure 7). 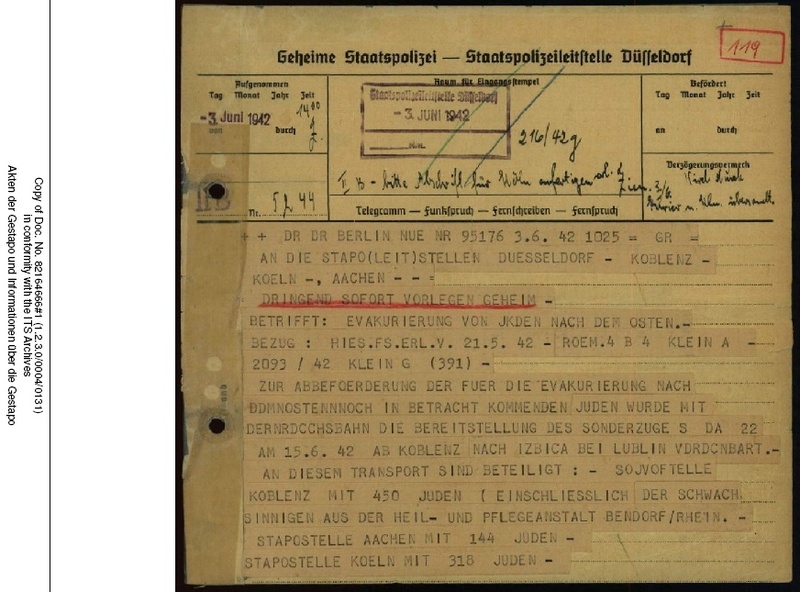 The "Saurer...gas van" of Einsatzkommando 9 received the license plate POL 71457. It stands to reason that the license plates POL 71458 - 71461 were given to the other Saurer gas vans constructed by the RSHA and dispatched to the Einsatzgruppen and Sonderkommando Chelmno. "The matter with the gas van was a unique action. These vans were constructed from case to case and distributed from Berlin as needed. The Eastern commanders requested the vans through the official channels, which was through us. This explains also why I submitted the telex of 15 June 1942. My telex goes back to a corresponding request of the commander of the Security Police in Minsk....If I'm asked, whether I knew the meaning of the S-vans upon sending the telex, then of course I cannot deny this. If I'm further asked, why I did sign the telex, then I have to reply that it was my duty to forward the requests from the troop." "The reply to Riga was drafted by me. I knew that the assigned vehicle was to be used as gas van." Amazingly, both Ingrid Weckert and Pierre Marais did not discuss the telexes despite these are part of Nuremberg evidence PS-501 known to them. Santiago Alvarez dedicated at least a few pages to the documents (The Gas Vans, p. 55 ff.). As expected for German documents too inconvenient for Holocaust denial, Alvarez is forced to resort to the forgery allegation. The telexes were compiled with the Becker letter as Nuremberg evidence PS-501. 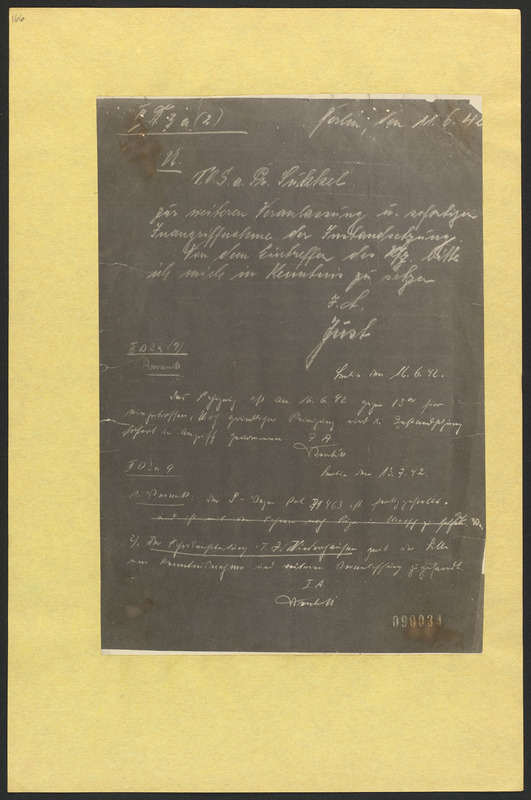 This set of documents also contains a sheet with copies of the incoming telexes from Schäfer and Trühe (Figure 8). These are most likely uncertified Allied copies that entered PS-501 by mistake. 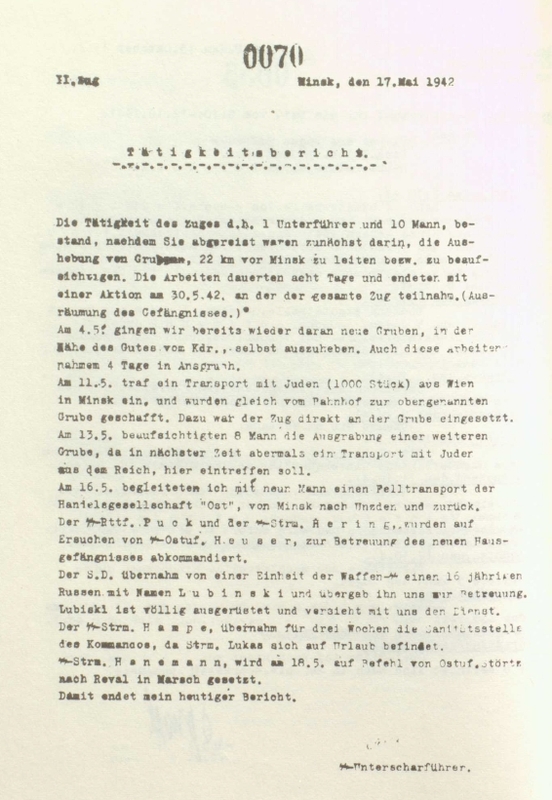 That these are post-war copies from the German originals is borne out by the lack of any typical characteristic markings from the RSHA bureaucracy, the typed transcription of the handwritten additions on the originals and, as observed by Alvarez, the switching of "z" for "y" in the German word for vehicle ("Fahryeug") indicating that somebody was typing on a for him foreign typewriter. Alvarez has only one more thing to say on the Schäfer telex supposedly indicating that "this telegram is not authentic". He claims that the "drivers mentioned in this telegram probably never existed" (Alvarez, The Gas Vans, p. 57 f.). One may suppose that such strong claim is backed up by some serious evidence. Yet, it comes merely from his personal incredulity that the drivers would have been tracked down by post-war investigators, if they existed, while they remain unknown up to day. But there is no reason why they should have been necessarily identified just from their common-or-garden surnames Götz and Meyer and their rank SS-Scharführer (Sergeant). "I can vaguely remember that the two SS-Scharführer were very reserved. I'm convinced that they did not tell the members of my motor pool about their work." "There were two drivers for the gas van, who also operated the vehicle. The drivers were two pretty young guys, one was Scharführer, the other - as far as I remember - Rottenführer. Both wore the same uniform as we did." The Trühe telex explains that there were two Diamond T gas vans operating in Minsk. Alvarez argues that "during the war, no U.S. truck company ever exported trucks on a considerable scale to European markets" and that there may have been only "a few selected Diamond trucks in Germany" (The Gas Vans, p. 59). First of all, the Diamond Ts did not have to be war-time imports, but could have been brought to Europe already in the 30s. Furthermore, it is false that "no U.S. truck company ever exported trucks on a considerable scale to European markets" during the war. For instance, White delivered 1500 trucks of their 704 S model to the French Army until Spring 1940 (Frank, Lastkraftwagen der Wehrmacht, p. 181). Alvarez provides no evidence that Diamond T trucks were not delivered to Western-European countries supported by the US until the Battle of France. Diamond T's were, in fact, captured by the German army for example in Norway, Belgium, France. Hence, the few Diamond T chassis used for constructing the gas vans were most likely captured vehicles obtained during the Western Campaign. In principle, it were also possible that the vehicles were captured in the East as the US supplied 376,000 trucks to the Soviet Union under the so called Land-Lease policy. However, as Nick has pointed out in the comment section, this is very unlikely under the given time scale and circumstances. The gas vans were constructed in November - December 1941 in Berlin. Even if "the first equipment (including more than 1,000 trucks) was dispatched in August 1941" to the Soviet Union as stated here, it is unrealistic to presume such vehicles could and would have ended up in Berlin a few weeks later. In addition, Alvarez worries about that US vehicles "would probably not have been used for anything requiring reliability" because "Germany could not get any spare parts for these trucks" (Alvarez, The Gas Vans, p. 59). The German army and paramilitary forces were employing captured vehicles all around. Alvarez overlooks that the issue during the war was not to decide between vehicles with reliable or unreliable spare part supply but between having any vehicle or none at all. The motor pool department of the RSHA was obviously not in the position to obtain brand new trucks of a make from German occupied Europe within the time frame and were forced to resort to a contigent of captured Diamond T chassis, which were, by the way, well known for their reliability. Alvarez' explanation that "the name Diamond was entered in this 'telegram' by a writer who thought that using one of the best-known truck models – best known to him – was a wise thing to do" is far-fetched. As if any supposed American forger could not come up with even a single German (or - other than Saurer - European) truck company. And even if so, it would have made more sense to simply leave out the make instead of introducing some superfluous detail that was only raising questions and possibly compromising the US. The reference to an American make used as gas van actually contradicts Alvarez' claim that "the mastermind behind the creation of these documents was probably Anglo-Saxon (i.e., U.S.-American)" (Alvarez, The Gas Vans, p. 59). Moreover, Alvarez has missed (and lost in his translation on p. 58) that the company name was misspelled "Daimond" - which is precisely how a native German speaker would write the term phonetically. In contrast to the post-war copy, which got the term right, the original of the telex was apparently authored by a poor English speaker or somebody who had no clue that Diamond T was an American company - just like one could expect from a clerk of the German Security Police and Security Service. The use of an American chassis for the small gas van type has been reported by quite a number of witnesses, e.g. the gas van drivers Johann Haßler (Diamond T; BArch B 162/2265, p. 115), Erich Gnewuch (Diamond T; BArch B 162/3411, p. 1008), Karl Gebl (American; BArch B 162/18154, p. 33) as well as the Security Police and Service members Willi Sch. (Diamond T;BArch B 162/5066, p. 261b), Josef Such. (American; BArch B 162/17921, p. 501), Johannes Schl. (Ford; BArch B 162/1052, p. 1035) and Heinrich Mü. (Chevrolet; BArch B 162/18154, p. 44). The fact that not all witnesses could agree on Diamond T also rules out that such detail was scripted by the Trühe telex. Alvarez further argues that "the telegram’s claim that three existing trucks were insufficient to 'process' the incoming weekly transports is untenable" and "shows that this telegram was produced in order to make the alleged ongoing mass murder look even bigger than it theoretically could have been" (Alvarez, The Gas Vans, p. 59). He has borrowed this argument from the Holocaust denier Thomas Kues (The Maly Trostenets "Extermination Camp"—A Preliminary Historiographical Survey, Part 2), who is rebutted by Roberto elsewhere on the blog (Thomas Kues on Maly Trostenets: Trying to create a false dilemma). In short, Alvarez is wrong to relate the number of people (900-1000) to be killed per transport to a whole working week, as if the Germans in Minsk were keen to spread the killing over such a long period and to dispatch their forces and to accommodate and supply such a large number of people subjected to mass murder anyway for several days. The most reasonable and expected schedule was to kill the people the very day and night they arrived. The fact that the commander of the Security Police in Minsk considered the three available gas vans as insufficient for this purpose demonstrates that he aimed for a killing schedule within one day. In practise, the extermination machinery went indeed at full throttle to finish the transports on the day of their arrival. This is shown by the high frequency of gassing trips. For example, the gas van driver Gnewuch testified that he made "5-6 trips for each transport" after the arrival of a transport (cited above). Franz Karl Hess from the Security Police Minsk testified that the gas vans performed six to seven trips (interrogation of Hess of 16 December 1945, cited from Gerlach, Kalkulierte Morde, p. 766). This is also clear from the above quoted report of a Waffen-SS platoon according to which the transport was "immediately sent from the railway station to the pit mentioned above" and from the lack of evidence that the deported people were accommodated in Minsk (other than the few selected for forced labour) and the numerous testimonial evidence on their immeadiate extermination. Alvarez finds it "striking that the most important information needed to send the van on its way – its destination – is not mentioned anywhere" (The Gas Vans, p. 61). It never occurred to him that this suggests that Trühe and Rauff had a common understanding how to proceed, either to dispatch vehicles always to the headquarter or directly to the units - unless stated otherwise. The - later crossed out - handwritten note that the gas van "is to be sent to Riga with the driver" shows that the RSHA assumed to sent the vehicle to Riga. In fact, several staff members of the Security Police in Minsk have testified that the gas vans had been dispatched to Minsk via Riga (interrogation of Georg Heuser of 6 October 1959, BArch B 162/4776, p. 40; interrogation of Franz Gennert of 29 September 1959, BArch B 162/4476, p. 29; interrogation of Karl Gebel of 2 April 1962 and 23 October 1962, BArch B 162/18154, p. 32ff. & B 162/6068, p. 624]). Possibly, the gas van drivers had to undergo a briefing in the headquarter prior their task. On p. 61, Alvarez claims that "[c]haracteristic for these metal hoses was their relatively low flexibility" and on p. 378 that "[du]ring the 1940s metal hoses of the required size were not flexible enough to make a 90° bend underneath the truck without danger of contact with the road surface". Gas-tight, pressure resistant, flexible metal hoses were available in Germany well before WW2. One of the leading metal hose companies was the Metallschlauch-Fabrik Pforzheim (today's Witzenmann GmbH). 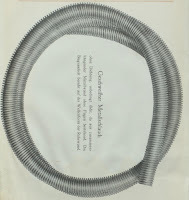 The company was founded by Heinrich Witzenmann, the construction principle of his first sealed metal hose patented in 1885 (together with the Frenchman Eugene Levavasseur) is shown in figure 9 (from Metallschlauch-Fabrik Pforzheim vormals Hch. Witzenmann, 1929, p. 5). 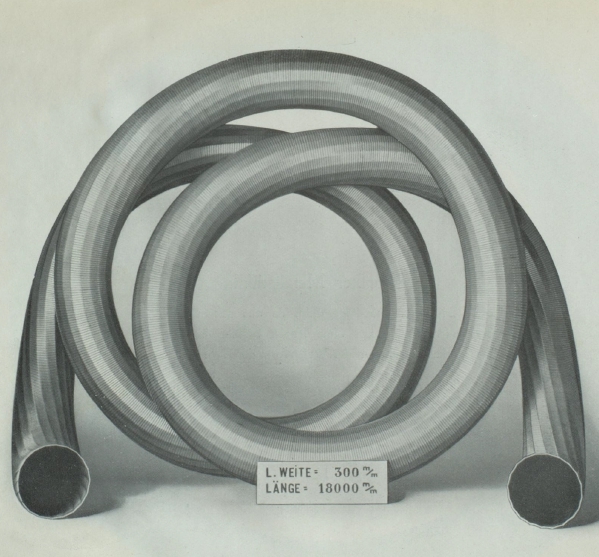 Figure 10 shows an actual metal hose with sealing produced by the Metallschlauch-Fabrik Pforzheim by 1929. So much on their "relatively low flexibility". There were also welded gas-tight metal hoses with high flexibility produced as shown in figure 11 (Metallschlauch-Fabrik Pforzheim vormals Hch. Witzenmann, 1929, p. 8). While it is not exectly known what kind and type of metal hose with what wall thickness, bending radius, reeinforcement was actually used for the gas vans, the argument on their necessarily lack of flexibility appears as unfounded. In fact, Alvarez did not examine what was available in Germany at the time to draw any reasonable conclusion here. He did not not support his argument by comparing the height from the ground to the cargo box with the bending radii of suitable gas-tight metal hoses in the 1940s. For all we know, the latter were well below the former, so that there was little risk of contact with the road surface. And even if - just for the sake of argument - their flexibility were too low for properly connecting the floor of the cargo box with the exhaust pipe, than an L-shape pipe coming from the floor, as proposed by Alvarez that would have been required in such case, cannot be ruled out either as there are only few witnesses, who could describe the contact between the metal hose and the cargo box and might have forgotten such detail. It were more likely that the gas vans were equipped with such L-shape connection in the floor than that there had been no gas vans at all. Alvarez cannot imagine the high demand of 100 m of spare metal hoses for three or four gas vans, since allegedly it "takes years before metal exhaust hoses or pipes rust through, in particular if they are zinc-plated". As so often, he fails to exercise some solid reasoning to demonstrate the point. He concedes that "acidic components of the exhaust gas itself, like nitrous and sulfuric oxides, which, if dissolved in water, form highly aggressive acids", but dismisses this corrosion mechanism because of supposed lack of water in the exhaust hoses. Yet, in the very next paragraph he talks about the "human body fluids....urine, blood, feces, saliva" but which "are not corrosive in any way". Even if it were true that these would not be corrosive on their own, it is precisely these human body fluids that can serve as solvent for the acidic components in the exhaust gas to form "highly aggressive acids". Furthermore, he did not take into account vomit, which is actually acidic. In fact, several witnesses who remembered body fluids in the gas vans testified on excrements and vomit inside the gas vans (Hans Mey. of the Security Police Minsk on vomit, interrogation of 19 August 1959, summary in BArch B 162/4476, p. 75; Edgar Enge of the Security Police Belgrade on "mainly notice vomit in the inside of the vehicle"; interrogation of 21 January 1966, BArch B 162/25920, p. 18; Heinz Schlechte on "excrements and vomit", interrogation of 6 November 1964, YVA TR.10/1118, vol. 5, p. 587, Julius Bauer, driver of Sonderkommando 4a of Einsatzgruppe C on "excrements and filth", interrogation of 2 August 1965, BArch B 162/18154, p. 102). It does not save Alvarez that "the ammonia which develops from urine, the main body fluid to be expected in a hypothetical mass murder scenario, is slightly alkaline and would therefore reduce the corrosion of the acidic exhaust gases by neutralizing them partially". It is neither clear that urine was the main body fluid in the gas vans nor that its amount and basicity was sufficient to neutralize the acidic components in an extent eliminating the problem of corrosion. The salts in human body fluids may have also had an impact on corrosion, e.g. chloride can lead to pitting corrosion in stainless steel and any sort of salts can influence the ability of zinc to passivate. In general, corrosion can be a complex phenomenon, even more so when there are various species involved. It is entirely possible that all sorts of body fluids and the high temperature exhaust gas would have quickly corroded the metal hoses connecting the exhaust pipe to the cargo box or at least degraded its sealings. Finally, Alvarez wonders that the Trühe telex did not provide the diameter of the hoses, which "could not be expected to be known by some pencil pusher in Berlin" (Alvarez, The Gas Vans, p. 63). However, according to the telexes, the "pencil pusher", who dealt with the request, was no other than the RHSA mechanic Harry Wentritt, who constructed the connection for the metal hoses and therefore knew exactly what kind of material was needed. Wentritt noted on 13 July 1942 on the Rauff telex that "[f]or technical reasons, only 5 rings of metal hoses of 10 m can be sent along". It makes perfectly sense that a pencil pusher in Riga did not consider it necessary to teach the motor pool department of the RSHA in Berlin about the size of a connection for gas vans constructed by themselves. Alvarez' lack of common sense and knowledge to understand the situation and his complete misinterpretation to support his faith in the forgery allegation is striking. The three telexes describe the story of a Saurer gas van with the license plate 71463 that has finished the liquidation of the Jewish camp in Serbia, gets transferred to Berlin for repair and maintenance at the RSHA in Berlin in order to get sent via Riga to Minsk to take part in the mass killing of Jews deported to Minsk. The documents are formally authentic as well as corroborated and explained by numerous other evidence. The "special treatment" of Jews with "exhaust hoses" leaves no doubt that this "special vehicle" was employed for homicidal gassings. In contrast to this, the forgery claim of Alvarez is entirely unsubstantiated. One minor correction regarding the relevance of a counter-argument: while the US certainly supplied plenty of trucks under Lend-Lease, the chance of a particular Lend-Lease Diamond T being shipped in time to be captured on the Eastern Front and to make its way back to Berlin for conversion by the RSHA by the spring of 1942 must be assessed as approximately zero. The capture of Diamond Ts in 1940 during the Western Campaign is surely the most probable provenance for the vehicles. I would relegate the Lend-Lease point to a metaphorical footnote. Agree, Nick, the hypothesis they were captured in the East is too unlikely. Actually, the Diamond Ts - making up the series of small gas vans - were dispatched from Berlin even earlier, in December 1941. I reworked the paragraph accordingly. Thanks for your critique. Great work as usual, Hans. Love your comment about "Daimond". It's always interesting to hear about German from actual native speakers such as yourself.